When I was growing up, our family was always taking road trips. There were five of us, Mother and Daddy, and the three kids: my younger brother Dan Jr., my little sister Kay, and myself. On one particular trip that I remember, we headed north from our house in northeastern Oklahoma to Murray, Nebraska to visit Aunt Jennie, who was Daddy’s aunt and my great aunt. For me, that trip to see Aunt Jennie was all about the food, and where, as a little girl, I learned the definition of hospitality. Before I can tell you about the food and hospitality though, I have to tell you about Aunt Jennie herself, and her daughter Co usin Gertrude. They lived in a big old-fashioned (which I now know as Victorian) house with a big wrap-around front porch, on a street full of old-fashioned houses, in a small Nebraska town south of Omaha. They also dressed in a very old-fashioned way: I can still picture Aunt Jennie and Cousin Gertrude, in their long black dresses; the kind from the tuirn of the century that were made out of taffeta or some other fabric that was stiff and shiny. Although eccentric, Aunt Jennie and Cousin Gertrude were extremely hospitable and amazing ladies when it came to food. When I remember that trip now, many years later, the whole scene seems surreal, even though I know that it really happened. It was like looking through a window and seeing what life might have been like in that big house, in that little town, in the early 1900’s. When we all came downstairs for breakfast, we would find the most gracious spread you could possibly imagine. You really can’t imagine it. They wouldn’t have just pancakes, or just bacon and eggs, or just anything else. Aunt Jennie and Cousin Gertrude would have all of it, laid out beautifully as a buffet, on a huge table in the center of a high-ceilinged dining room awash with morning light from a big window: dish after dish of pancakes, bacon, sausages, eggs, hot breads, etc. etc. etc. They loved putting out the food that they had made for us, and I do believe that they did all their cooking in those long-sleeved, up-to-the-neck, black taffeta dresses. I know that the pineapple is an old New England symbol of hospitality from Colonial times, and even though Aunt Jennie and Cousin Gertrude didn’t have a pineapple carved above their front door, as they lived in the Midwest, they themselves were a symbol of hospitality. During our visit, they could not do enough to make us feel welcome and lavish on us their bounty. In addition to the amazing breakfasts, the thing I most remember is that they had food displayed all over the house. At the top of the stairs, you would see a big bowl of popcorn. Around the corner might be a bowl of apples. Somewhere else, there would be a bowl of nuts. They liked bowls, big bowls, and they liked spreading around their hospitality in those bowls. 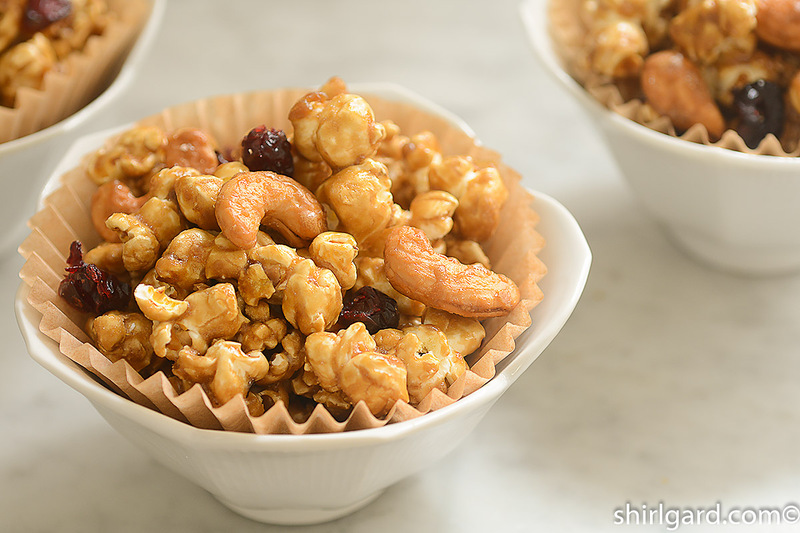 In the spirit of Aunt Jennie and Cousin Gertrude, here is my recipe for Caramel Popcorn with Cashews and Cranberries, a very delicious and hospitable confection, which you can pass around in a big bowl during the holidays. 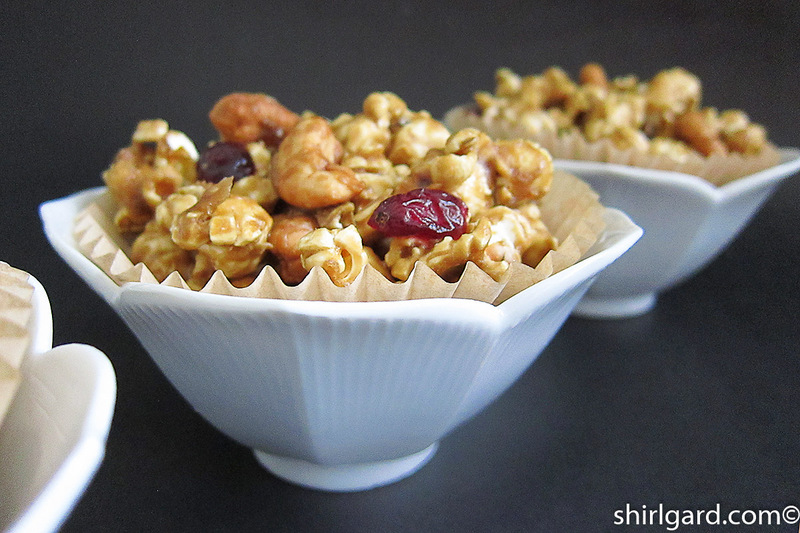 Or, make little individual bowls for holiday table favors or party favors. 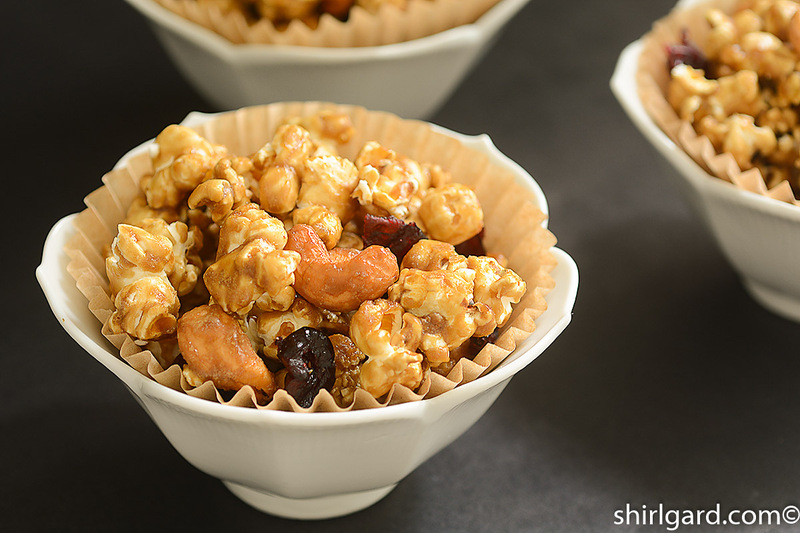 I love popcorn, and the idea that you can cover each popped kernel with a coating of caramel, and then mix in roasted salted cashews and dried cranberries is even better. 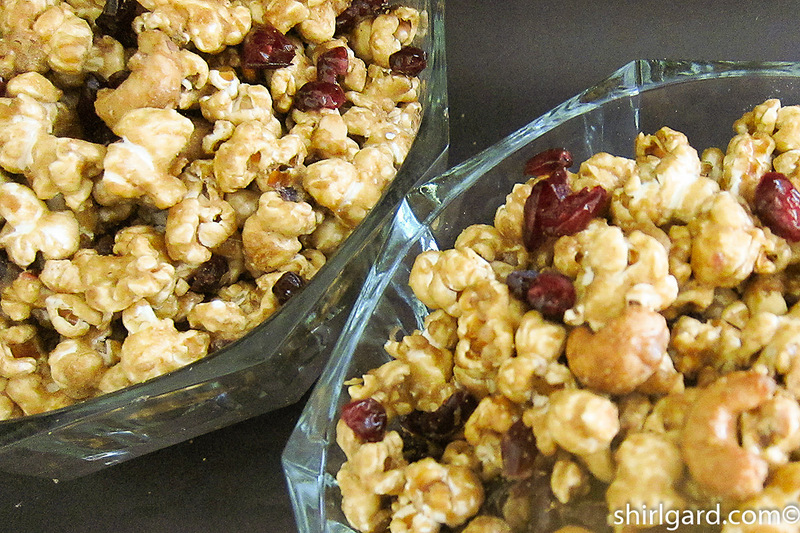 Pop the corn in two batches. Heat the oil until a few kernels pop. Add balance of popcorn for one batch. 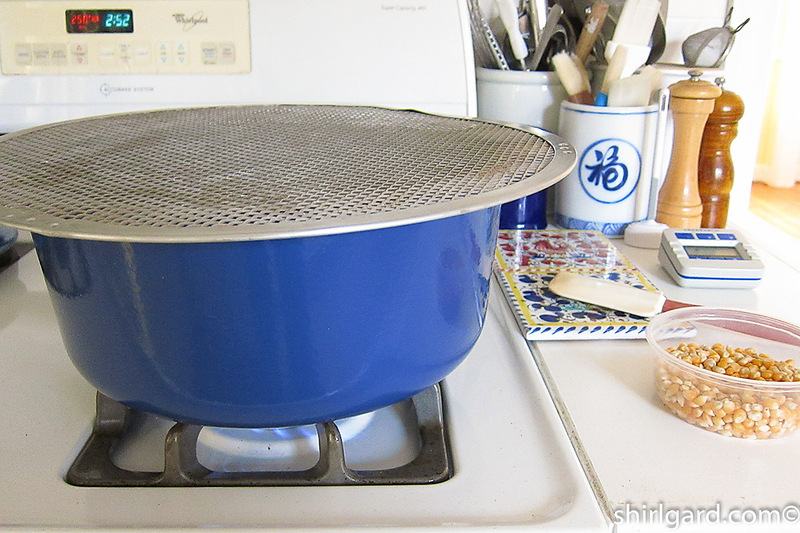 Use a large heavy pot with lid slightly ajar or use a pizza screen. 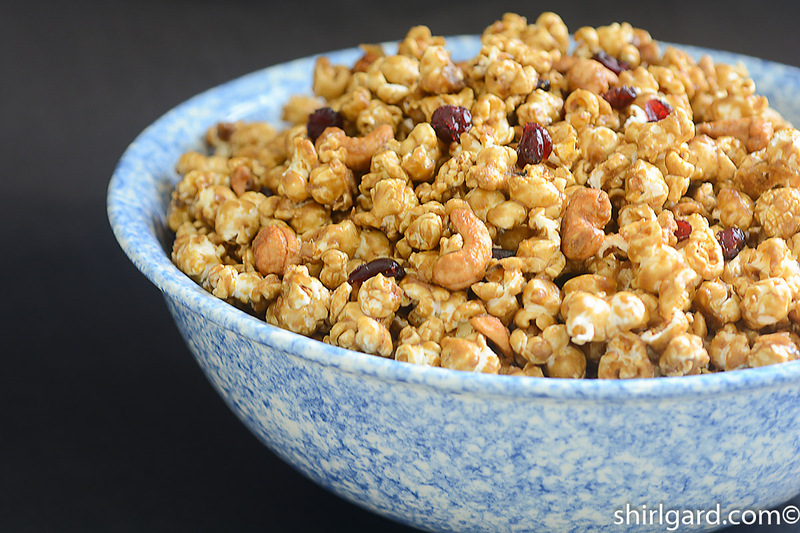 Mix the cooked caramel into the popped corn. Bake for one hour at low oven temperatures. Let cool on the sheet pans. 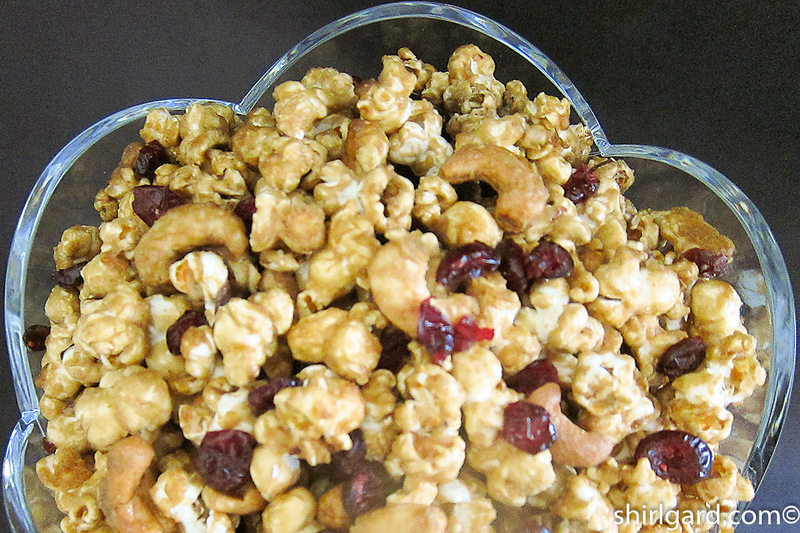 Finished Caramel Popcorn with Cashews & Cranberries. Make Holiday Table Favors or Party Favors: These favors were made using white porcelain Lotus Bowls (4 1/2″ diameter) and large unbleached bake cups (2 1/4″ x 1 7/8″). How to Adjust the Cooking Temperature of your Caramel Based on your Altitude: This is a very important step to take when making candies or confections involving cooked sugar. Candymaking by Ruth A Kendrick & Pauline H. Atkinson (1987). This is a very reliable candy cookbook for recipes as well as a great reference book. I have been using it for years. To get a copy of this book: Candymaking. 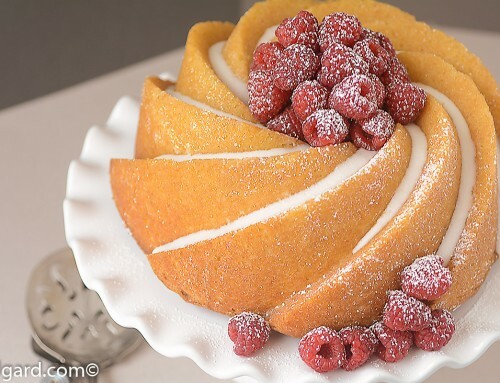 This confection is one that, as a pastry chef, I have made many many times. 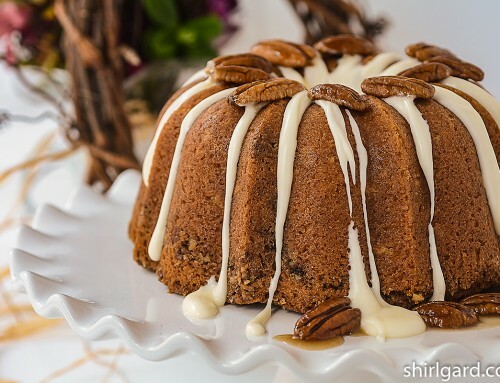 It is always a hit, especially during the holidays. Make this! Your family and friends will love it. An added bonus is that it keeps well, at least a month, if you keep it in a tightly covered container or in plastic Ziploc bags. PRE-HEAT the oven to 250° F (121° C). LINE 4 half sheet pans with parchment. SET UP a large heavy pot (6 or 7 quart capacity). 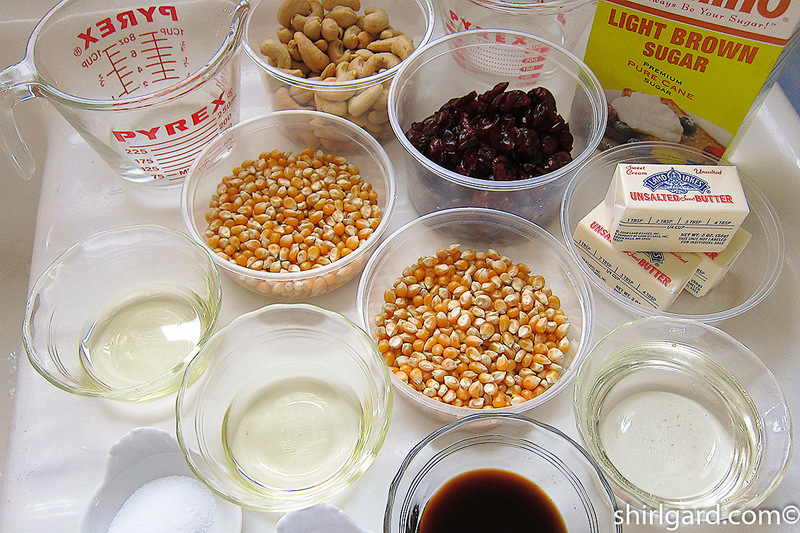 I use a Le Creuset 7¼ quart Dutch oven for both popping the corn and cooking the caramel. Having a large enough pot is very important because you don't want the caramel to boil over. To check the size of your pot, set it in the sink and fill with quarts of water until it is full. Also, have a thermometer handy; I like to use a digital probe thermometer. Note: If you have an electric popcorn popper, you can use that to pop the corn. 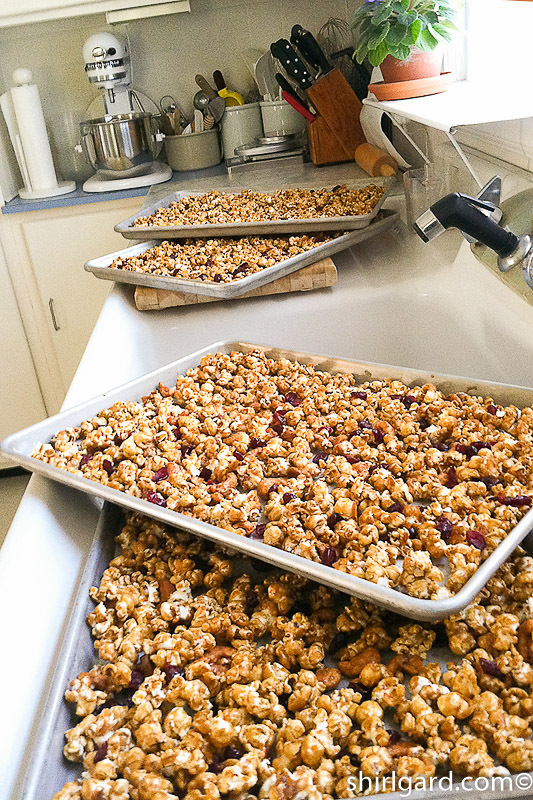 POP THE CORN: For each batch, pour oil into pot and add several kernels of popcorn. 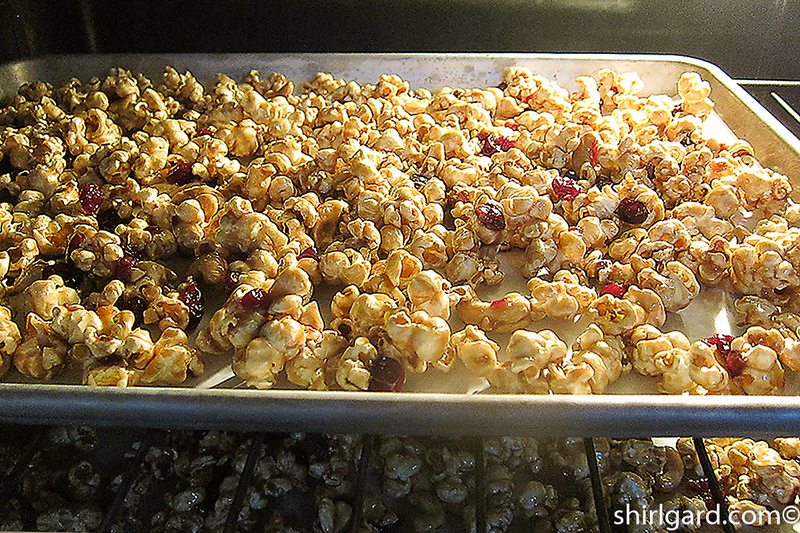 When the kernels pop, add the rest of the popcorn and pop over medium-high heat with the lid partially ajar, (or use a pizza screen), shaking occasionally. 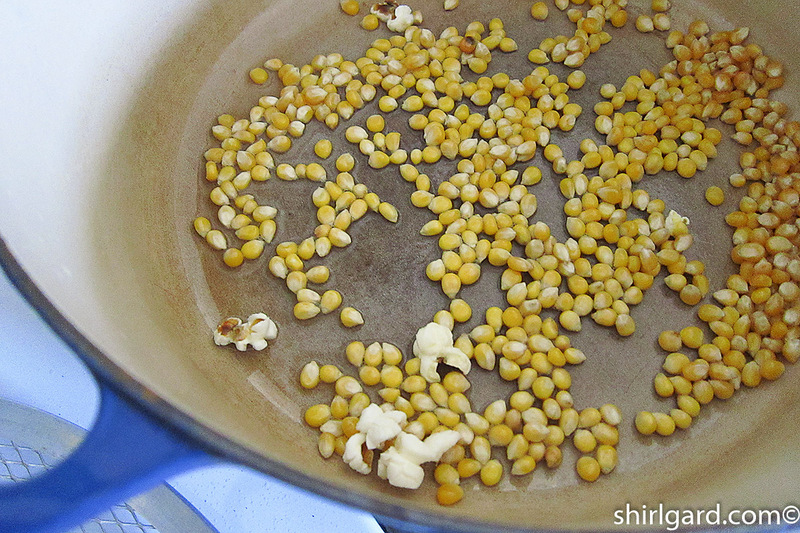 Lift the popped corn out of the pot, leaving the unpopped kernels behind. 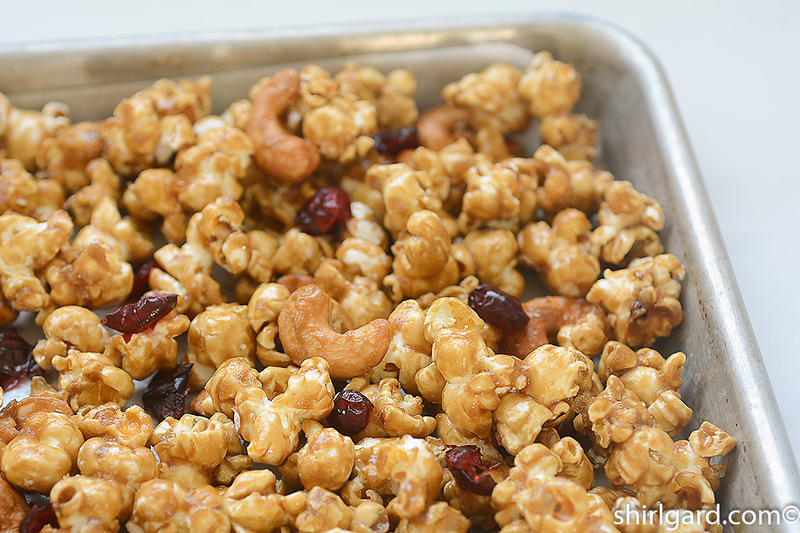 Very important not to have unpopped kernels in the finished Caramel Popcorn; they can ruin the results and break a tooth. 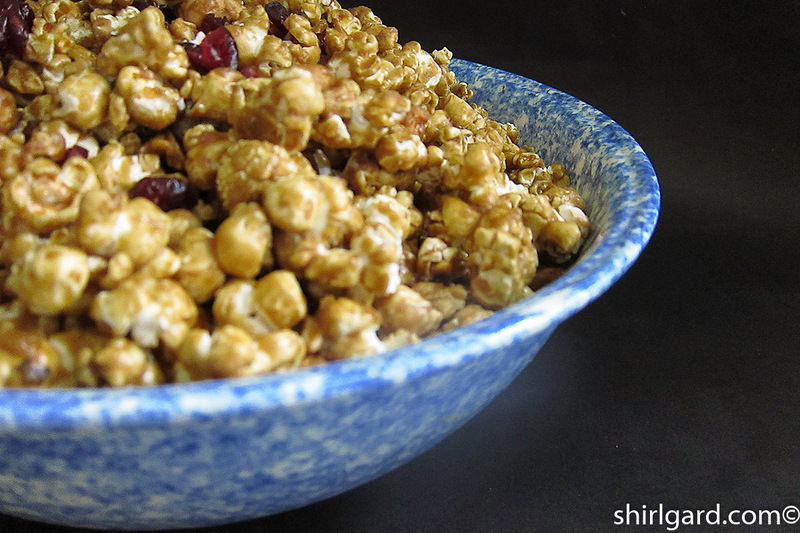 Place each batch of popcorn in a separate large stainless steel bowl. One of the bowls should be large enough to hold the whole batch. 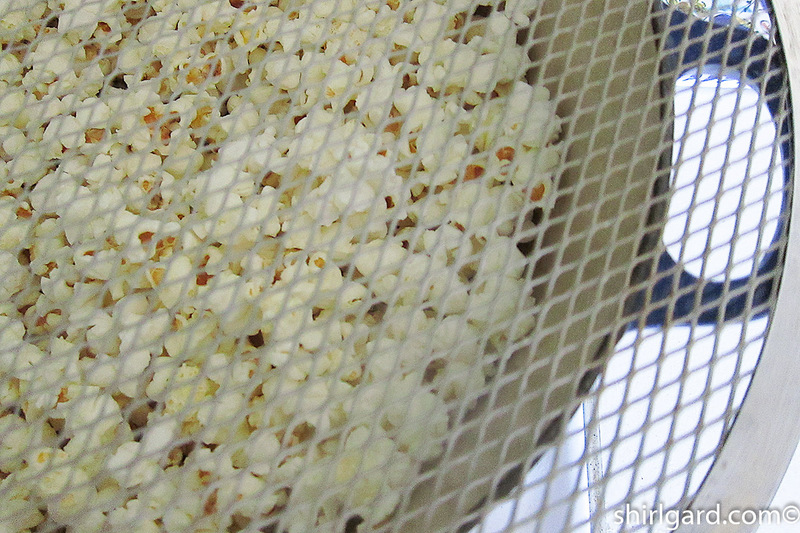 If you have an electric popcorn popper, you can use that for popping the corn. 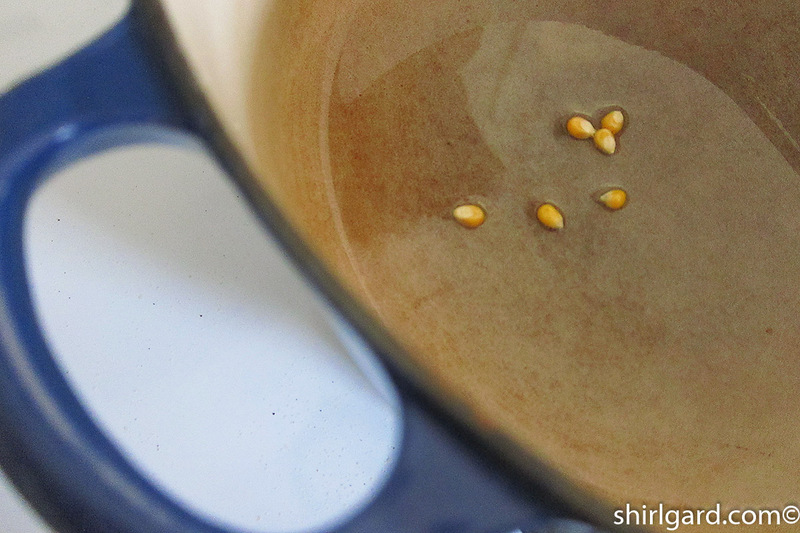 Clean the pot and use for making the Caramel Syrup. 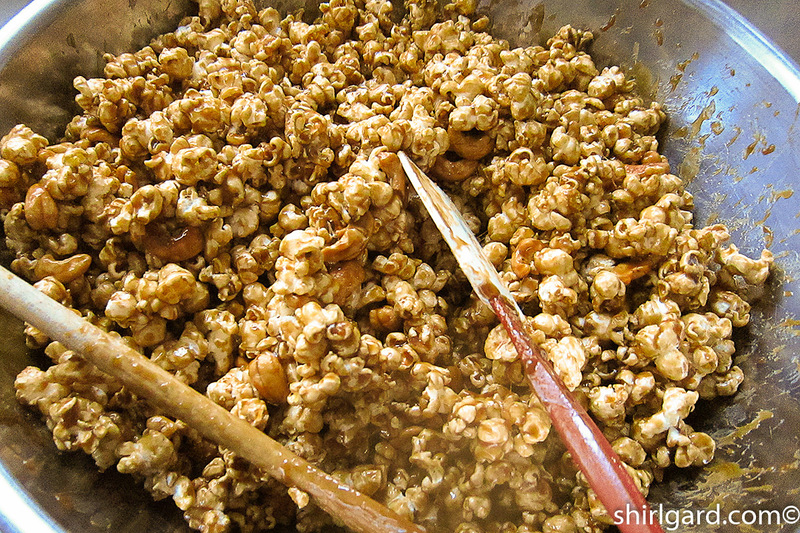 COOK THE CARAMEL SYRUP: MELT the butter in same pot used for popping the corn. Add the brown sugar, corn syrup, hot water, and salt. 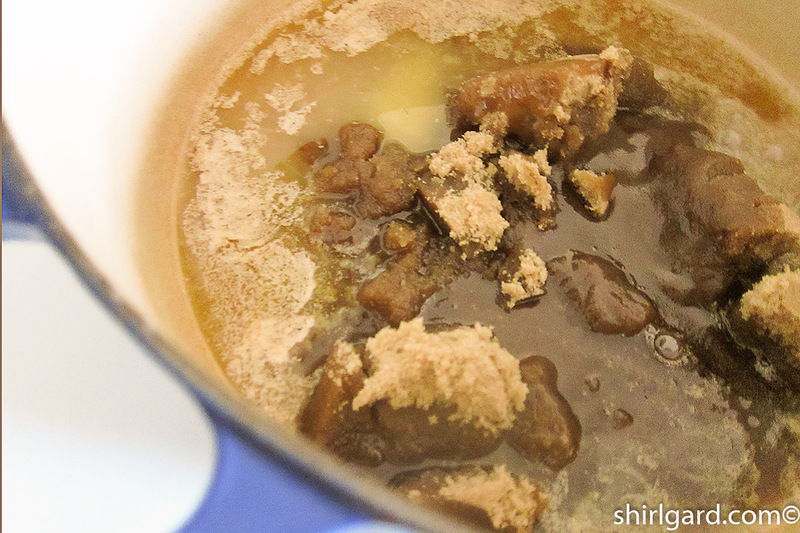 Stir over medium heat until the sugar dissolves completely; stop stirring when the syrup comes to a boil. Brush down sides of pan with water as needed to keep the sides clean. CLIP a candy thermometer to the inside of the pan or use a probe thermometer. COOK, without stirring, until the mixture reaches 260° F (127° C) (hard ball stage). 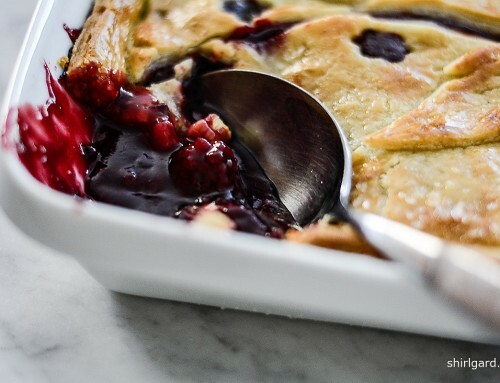 Remove the pan from the heat and quickly stir in the baking soda and vanilla. Stir in cold water to stop cooking. 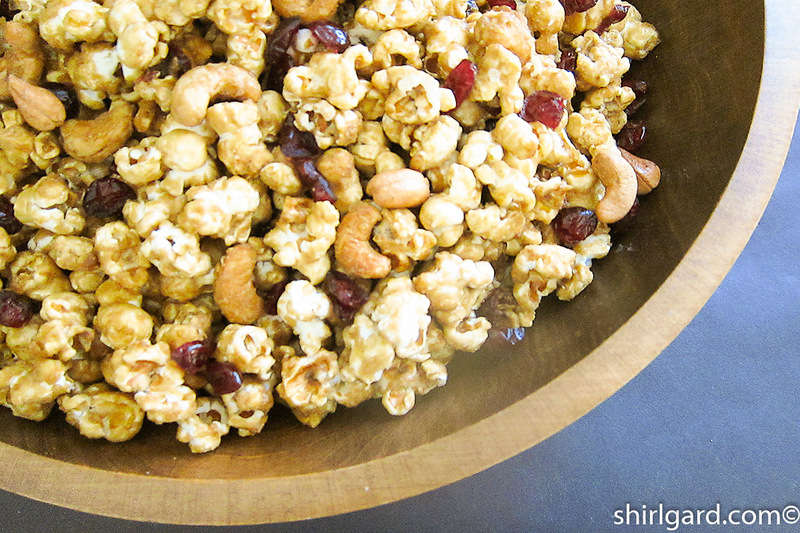 Add cashews. DRIZZLE half the hot caramel, using a large ladle, over one bowl (the large one) of popped corn. Toss gently with 2 wooden spoons, or a wooden spoon and a red-handle heat-resistant rubber spatula, until all the popcorn is well coated. 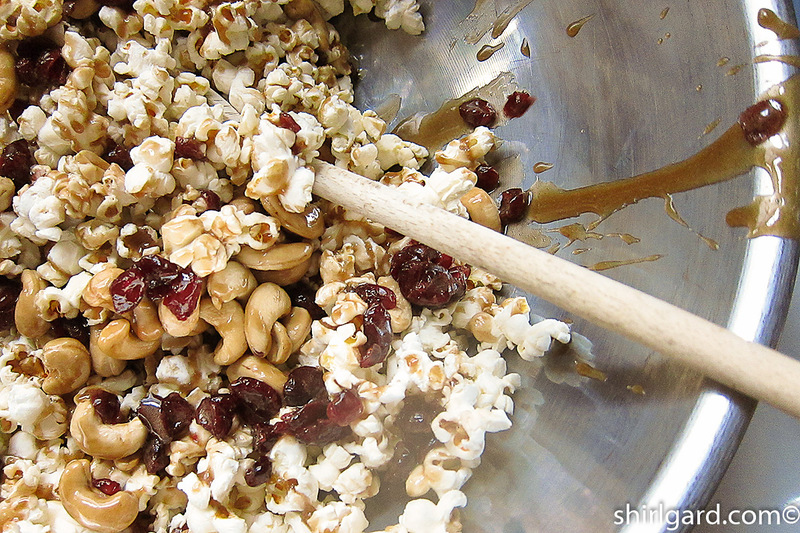 Add second bowl of popcorn and drizzle with balance of caramel. 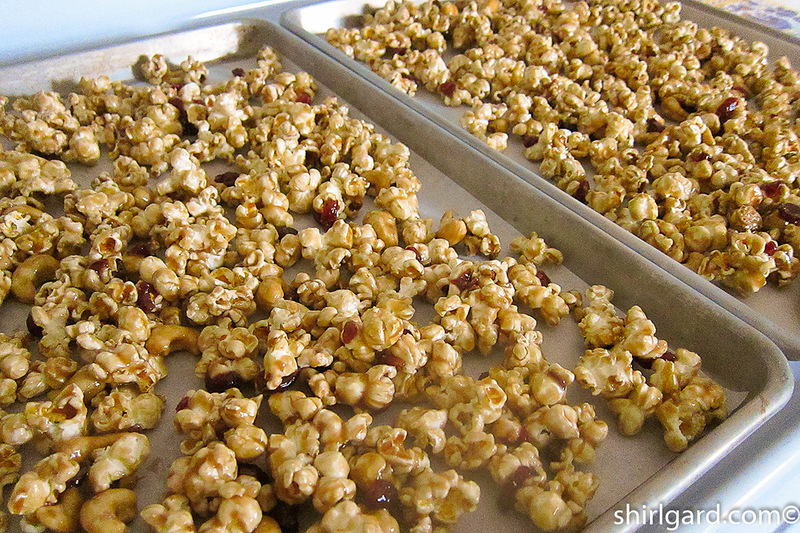 Make sure caramel is evenly distributed and all popped kernels evenly coated. DIVIDE among the four half sheet pans. Spread evenly in pans. 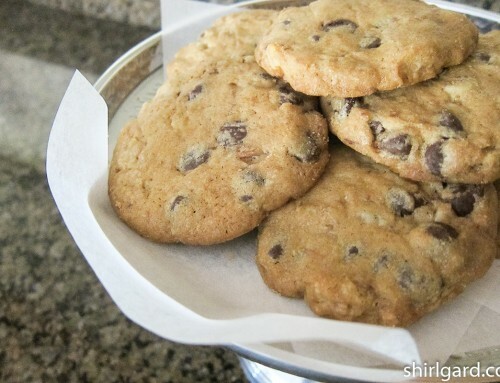 BAKE IN TWO BATCHES - Two pans at a time: For each batch, BAKE 30 minutes at 250° F (121° C). Stir the popcorn gently and rotate the pans. Turn down the oven to 225° F (107° C) and BAKE another 30 minutes. Total baking time = 1 hour. 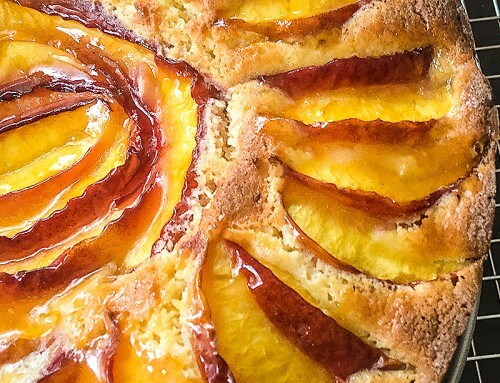 REMOVE the pans from the oven. 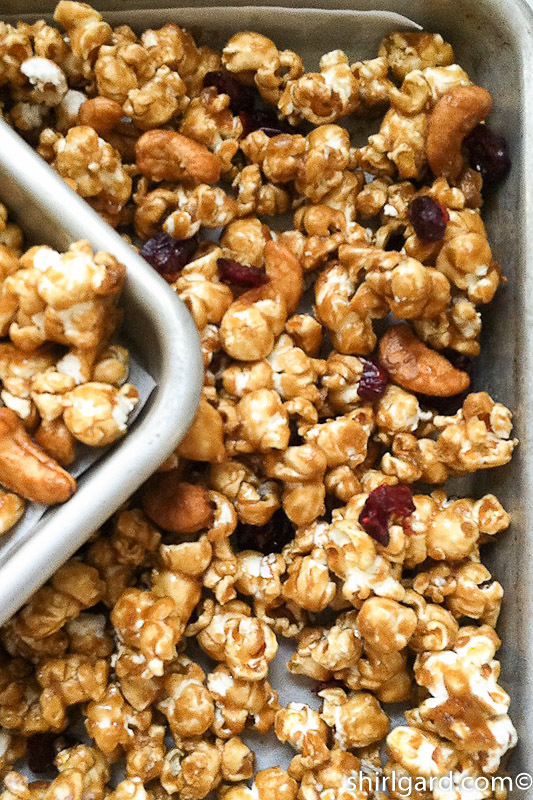 Separate the kernels of popcorn while still hot. Caution! The popcorn will be extremely hot. Use vinyl gloves if necessary. 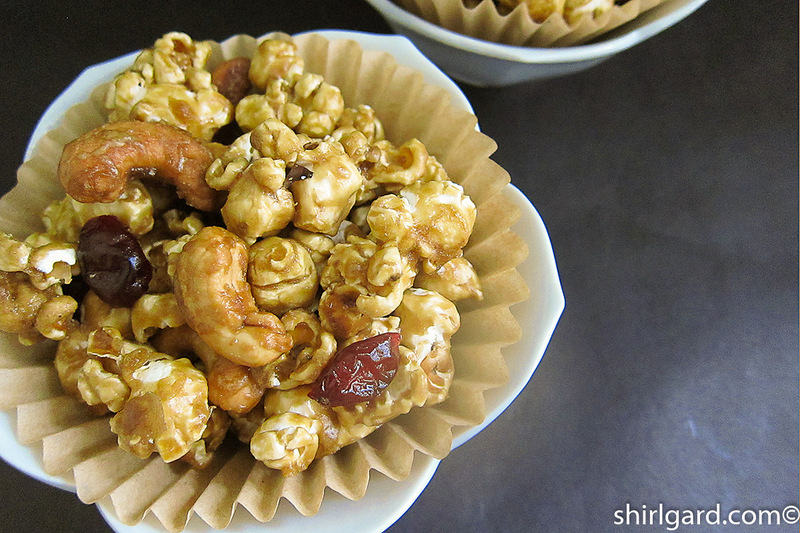 Allow the caramel corn to cool completely. 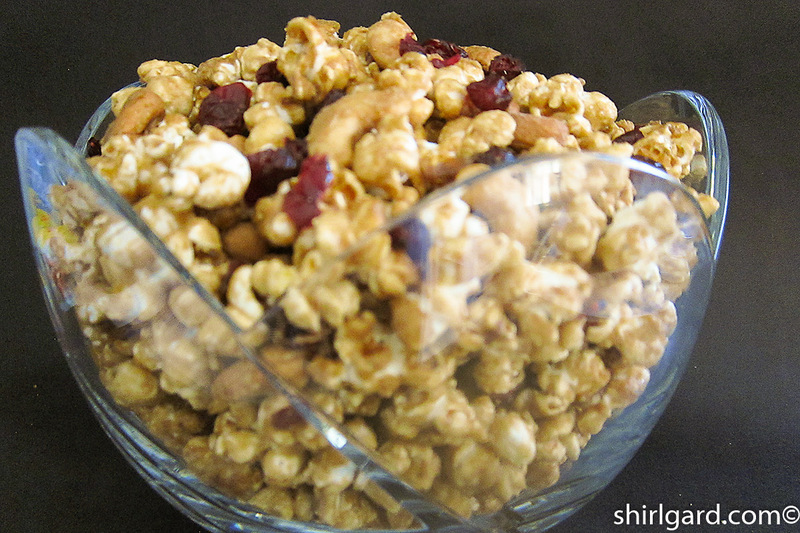 TRANSFER the baked popcorn from the pans to a large bowl and toss with the dried cranberries until evenly distributed. 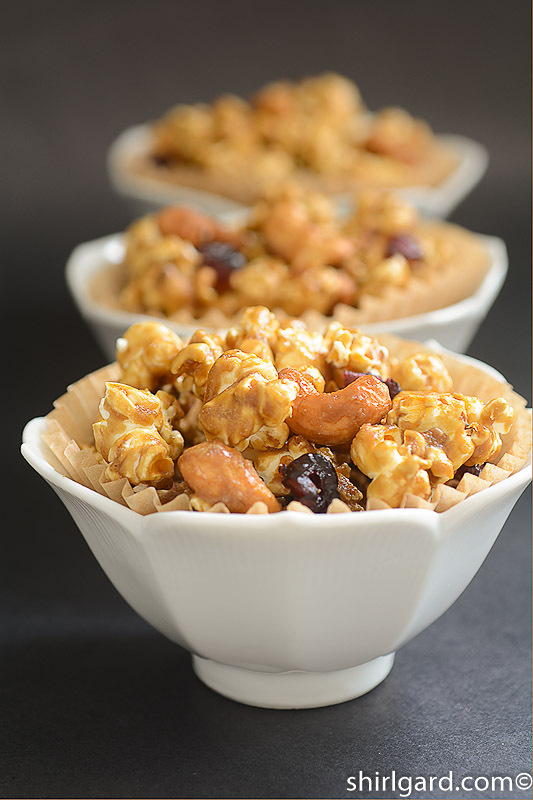 STORE the caramel popcorn in an air-tight container at room temperature for up to a month. Or, pack into plastic bag Ziploc bags. Recipe adapted from The Ultimate Candy Book by Bruce Weinstein (2000).